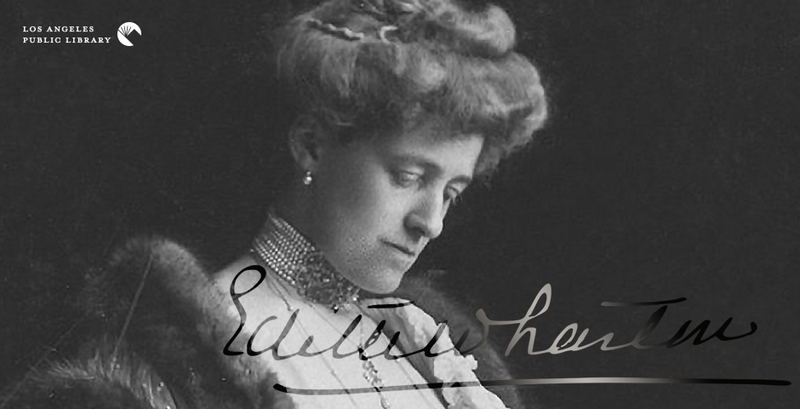 Edith Wharton was born on January 24, 1862. Wharton didn't publish her first novel until she was 40, but her stories of the New York social elite at the end of the 19th century made her one of America's most popular and respected novelists. Wharton came by her knowledge of America's aristocracy by birth. She was born Edith Jones, daughter of a wealthy family that had made its fortune in real estate. Some scholars believe that the phrase "keeping up with the Joneses" was originally a reference to her family. In the years following the Civil War, Wharton traveled with her parents across Europe. She was educated, and largely cared for, by a series of nannies and governesses. During her travels, she became fluent in French, German, and Italian. Wharton was frustrated by the limited educational opportunities allowed to girls and young women of her era, and read as much as she could to further her own education. Her mother did not allow her to read novels, which were still considered disreputable in some circles. Her father, though, allowed her access to his large library, and Wharton read a great deal of philosophy, poetry, and Greek and Roman literature. Even as a young girl, Wharton was interested in writing. She wrote her first fiction at the age of 11, but her mother was so discouraging of her efforts that Wharton switched to writing poetry, which was thought a more appropriate pursuit for a young lady. Her first published work, a translation of a German poem, appeared when she was only 15, though it was published under the name of a family friend; her parents insisted that her name could not appear on it. By 1878, Wharton's father had relented somewhat, and arranged for the private publication of a small collection of about 30 of her poems. That would be the end of her writing career for about a decade, as she entered her adult life. Wharton was presented as a debutante to New York society in 1879. She married Edward "Teddy" Wharton in 1885. Teddy was from a socially suitable Boston family, and Edith's family approved of the marriage. The Whartons' marriage began well; they both enjoyed travel and spent every spring in Europe. But Teddy suffered from depression and other mental health problems, and as his condition declined, travel became impossible. Eventually, the Whartons were spending almost all of their time at their home in Massachusetts, where Edith began to explore her other interests—writing and design. She published her first short story in 1901. Her first book wasn't fiction, but a book on interior design, The Decoration of Houses (e-book | e-audio | print | audio), in which Wharton and her co-author, architect Ogden Codman, argued that the fussy clutter of the Victorian era should be replaced with simpler, more functional design. The book was a seminal work in its field and strongly influenced interior design for decades. Wharton's first major success as a fiction writer came in 1905 with The House of Mirth (e-book | e-audio | print | audio), the tale of one young woman's social decline. Her 1911 novella Ethan Frome (e-book | e-audio | print | audio) was a departure for Wharton, not set among New York society; its tragic love triangle took place among the working class in a small New England village. Wharton returned to her usual setting in 1913 with The Custom of the Country (e-book | e-audio | print | audio), in which an ambitious young woman from the Midwest seeks success and a suitable husband. By now, Teddy's declining health had made their marriage impossible to sustain. The Whartons were divorced in 1913, and Edith moved to France, where she lived for the rest of her life. She returned to the United States only once, to receive an honorary doctorate from Yale in 1923. Wharton was living at her country estate when World War I began. At a time when many were leaving Paris for the relative safety of the countryside, she returned to her Paris apartment and did an enormous amount of charitable work during the war. She opened a workroom where unemployed women could make a small salary doing sewing work, and she raised money to assist war refugees. She was one of the few Americans allowed to travel to the front lines, and wrote several articles about her experiences, collected as Fighting France, from Dunkerque to Belfort (e-book). After the war, Wharton completed her most enduring work, The Age of Innocence (e-book | e-audio | print | audio), the story of a young man torn between his innocent fiancee and her more sophisticated cousin. The novel was awarded the Pulitzer Prize in 1921; Wharton was the first woman to receive the award. Though her later work is less well known today, her novels and short stories continued to be popular with readers and critics. She published a collection of essays on writing, The Writing of Fiction (e-book | print), in 1925, and a memoir, A Backward Glance (e-book | print), in 1934. Wharton died of a stroke on August 11, 1937. At the time of her death, she and Ogden Codman were working on a new edition of The Decoration of Houses. Many of Wharton's other novels and story collections are available in e-book or e-audio formats at OverDrive or Hoopla. A sampling of her best short fiction is available in two volumes, covering 1891-1910 (e-book | print) and 1911-1937 (print); there are also collections focusing on her New York stories (e-book | print) and her ghost stories (e-book | print). Two full-length biographies of Wharton are available, Hermione Lee's Edith Wharton (e-book | print | audio) and Cynthia Griffin Wolff's A Feast of Words (e-audio | print). William Hill Brown's novel The Power of Sympathy (e-book | print) was published in Boston; it is generally believed to be the first American novel. Brown was inspired by a romantic scandal involving one of his neighbors. Most of Brown's readers would have known who the book was really about since the scandal was widely known throughout New England. Brown presents his novel as a moral tale, designed to instruct the reader—the young female reader, in particular—how to avoid the perils of seduction, but it seems likely that most readers simply enjoyed it as a titillating story of illicit romance. Buddy DeSylva was born. DeSylva was a popular songwriter of the 1920s and 1930s. He wrote with many partners, but most of his best-known songs are written either with George Gershwin or with Lew Brown and Ray Henderson. DeSylva's standards include "If You Knew Susie," "Look for the Silver Lining," "Button Up Your Overcoat," and "California, Here I Come." Those songs and many others are included in a Great Songwriters collection of DeSylva's work. Linda Blair was born. Blair had played a few small film and television roles when she was cast at the age of 13 in The Exorcist. The movie was an unexpected success, and Blair was nominated for an Academy Award. She spent the rest of her teen years working primarily in TV movies, and returned to theatrical films in the 1980s, usually starring in low-budget horror and exploitation movies. The 1981 Hell Night is typical of her work; while it wasn't well received when it was released, it has developed an enthusiastic cult following. The first United States patent for peanut butter was issued in 1884. The brands that dominate the American market have been around for a long time—Peter Pan since 1928, Skippy since 1932, and Jif since 1955. We think of peanut butter mostly as a filling for sandwiches, or as an ingredient in candy and cookies, but in much of the world, it's the basis for savory soups and sauces. Jon Krampner's Creamy & Crunchy (e-book | print) is a history of peanut butter in the United States.